I really wanted to name this salad Finnley's Favorite Salad in the Entire World but I think it might be a bit too long. The girl loves red onions in rice vinegar. We first had this salad a few weeks ago at our local Japanese restaurant. I wasn't really sure what I was ordering but I knew that I liked tofu and red onions. What could there be to not like? NOTHING! It was delicious and Cory barely got any of it. When we got home I knew that this needed to be added to our monthly menu line up. To be honest the tofu freaked me out. 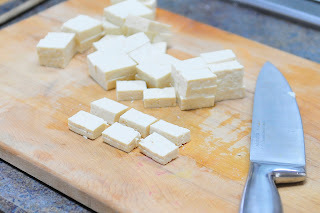 I had no idea what I was doing when it came to frying tofu and set out on a mission to dig a little deeper. I own several cookbooks that helped me to figure it out. The method that I am using in this recipe is by far my favorite because its a simple process of heating up some oil, tossing the cubes of tofu in a starch and frying until golden brown. I experimented with deep frying the pieces and it was messy and my tofu was a bit oily. I think I am not set up to deep fry in my home kitchen and I will let the restaurants tend to that process. I might need to invest in a Fry Daddy, but again, the pan fried method worked for us. The tofu was crispy on the outside and tender on the inside--perfect! 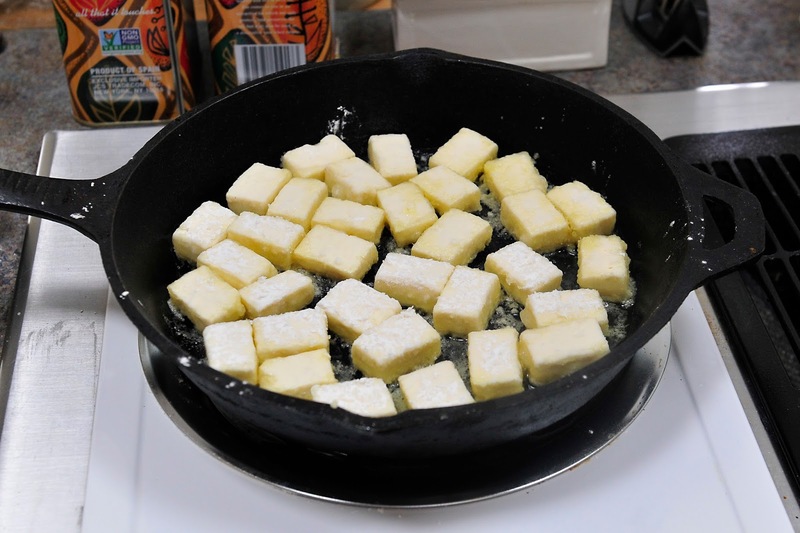 I fry up a whole block of extra firm tofu because it reheats well for other dishes. I also used it in the recipe coming out on Friday for my Asian Tofu Salad with cashews and toasted sesame seeds. A few weeks ago we had company and I threw this together in a very short amount of time. My brother-n-law and sister-n-law thought the salad was a success. During the photo shoot, Finnley, could not hold back. She sat right down and started helping herself to her salad. She was too cute to say no and so I continued shooting and she continued to eat. I love the picture above with her cute feet straddling her salad. She is growing up too fast and these little moments remind me of that. 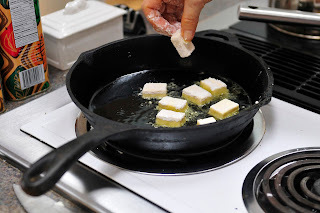 Below I will show you step by step how I prepare the tofu to fry. The salad starts with four simple ingredients: red onion, rice vinegar, salt and pepper. 1. 30 minutes before you make your salad prepare the tofu. See the images below to help you with this step. 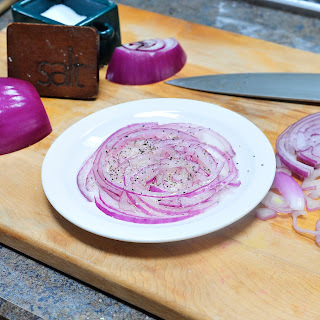 Also cut the red onion and add the salt, pepper and rice vinegar. 2. 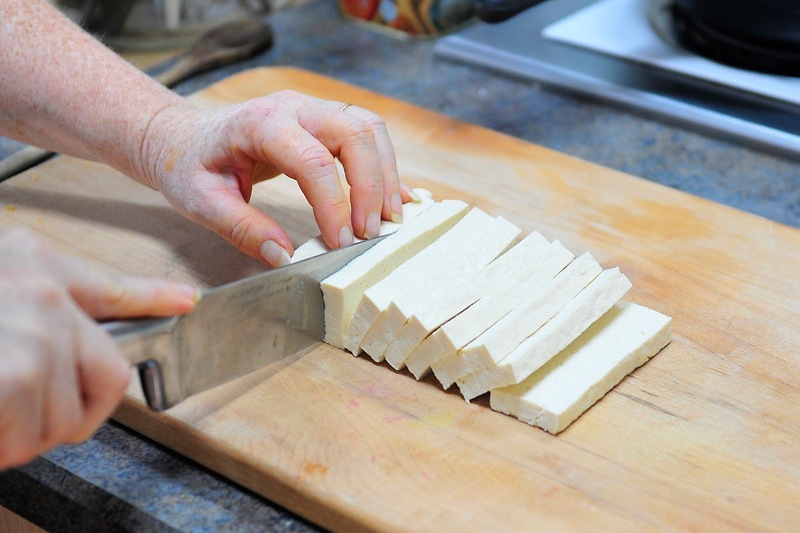 After 30 minutes, cut tofu into slices and then small pieces. Toss in starch of your choice (corn, arrowroot, potato). 3. Heat enough oil to cover the bottom of a skillet. Add tofu pieces one at a time. They might clump together if you toss them all in at once. 4. Fry on each side until golden brown and remove to a cookie rack until ready to add to the red onion. 5. 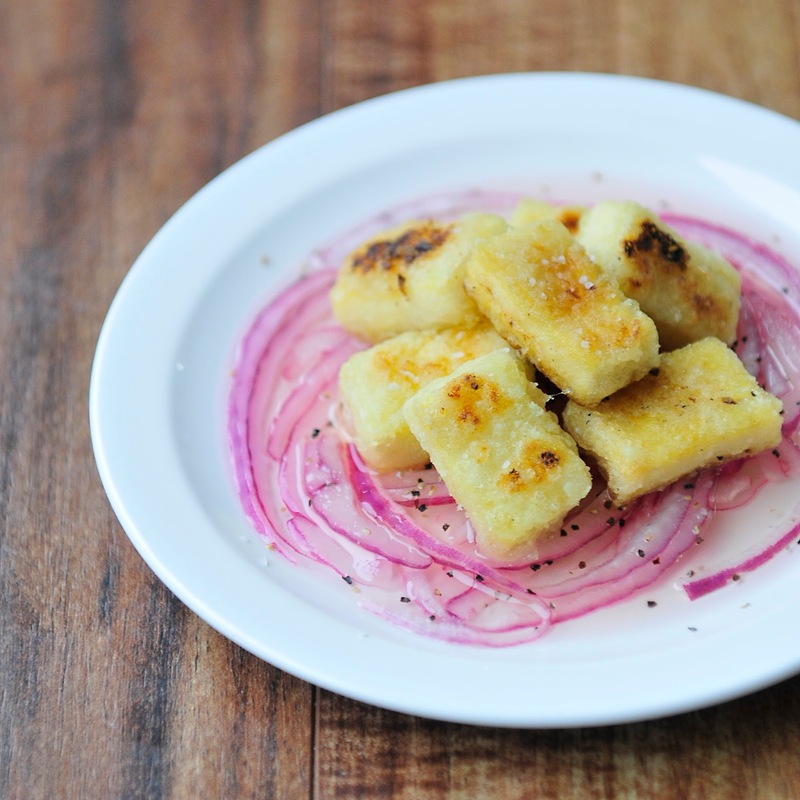 Top red onion salad with warm tofu and serve. 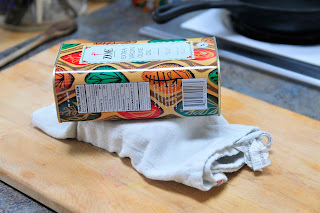 This is how I remove the excess water from my tofu. I wrap it in a dish towel and add something heavy to the top of it. The dish towel will absorb the extra water and create a more dense block of tofu for frying. I slice the tofu into 1/2 widths. I then take each slice and make it 6 pieces. Heat my oil, and add each piece one at a time. Let get golden brown on each side. Remove to cookie rack. I was lucky enough to be the sister-n-law. It was DELICOUS! Cannot wait to make it at home!